Pictured above (tanakawho/Flickr.com) is a lotus seed head. You're not afraid of it, are you? Strangely enough, images like this are viscerally upsetting to 16% of people. 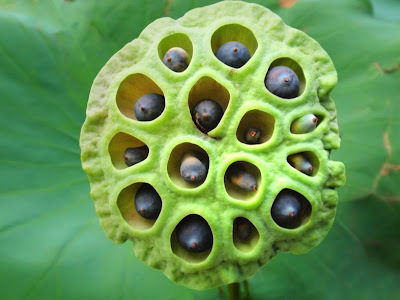 In a condition known as trypophobia – well-documented anecdotally, but not studied scientifically until now – sufferers are horrified by the sight of clustered holes. Psychologists Geoff Cole and Arnold Wilkins of the Centre for Brain Science at the University of Essex studied the condition and found that photographs of venomous animals elicited the same phobic response. They speculate that the fear is an ancient biologically-driven response to danger. Cole emphasizes, “We think that everyone has trypophobic tendencies even though they may not be aware of it. We found that people who don’t have the phobia still rate trypophobic images as less comfortable to look at than other images.” Personally, I can't imagine being frightened by honeycombs, soap bubbles, or – God forbid – aerated chocolate!